Cynthia Toussaint was a promising, 21-year-old ballerina when she was struck by a seemingly simple hamstring injury that ultimately led to a lifetime of widespread pain. After being a performer for so many years, Toussaint was accustomed to the bright lights and action of the stage. Now she would have to learn to manage the burning heat and immobility of chronic pain. “I had just had gotten a role on the TV show Fame when I was struck with CRPS,” Toussaint said in a recent interview. Complex Regional Pain Syndrome (CRPS) is a chronic pain condition believed to be cause by damage to or malfunction of the peripheral and central nervous symptoms. Formerly known as Reflex Sympathetic Dystrophy (RSD), the neurological condition is characterized a constant burning pain, inflammation of tissues and affected joints, contractions of the blood vessels (vasoconstriction) and muscles of the extremities (spasms), and changes in skin color, texture and temperature. People with CRPS may also have motor dysfunction (including dystonia), excessive sweating and extreme sensitivity to temperature, sound, vibration and touch. Undiagnosed for 13 years, Touissant was told her symptoms were “all in her head.” Meanwhile, her condition worsened and left her bedridden for a decade. “I was unable to speak while the disease spread throughout my entire body and ravaged my vocal chords,” she said. Toussaint was finally diagnosed with CRPS in 1995, along with the overlapping condition fibromyalgia. Since then, she has experienced significant improvement and moved from the bed into a wheelchair. She is presently experiencing her first partial CRPS remission in 32 years and can now swim a mile. “I can swim a mile but I can’t walk a block,” Toussaint quipped. OIC, or opioid-induced constipation, is a serious side effect of taking opioids. For Toussaint, OIC resulted in a hiatal hernia after consistent straining. This straining also exacerbates her CRPS pain. While Cynthia must sometimes rely on Garrett to “be her legs,” she describes herself as a very independent person who uses her wheelchair whenever she can. She counsels otherwise self-reliant people with chronic pain to just honestly ask for help when they need it. “I’ve gotten very good at asking and sort of demanding. I sort of give John orders—I have to admit—at this point,” she said. Her husband seems to take the added responsibilities in stride. “It always gives me a great opportunity to put my arms around her, which is not such a bad thing, you know?” he said. John recognizes how stressful and energy-consuming being a caregiver can be. He notes how easy it is for people in chronic, long-term caregiver situations especially to lose themselves, giving up their own dreams, ambitions and goals. He urges loved ones to find ways to carve out time for themselves and their own pursuits as well. One of the passions that Cynthia and John share is promoting better care and wellness for women in pain, which is what they accomplish with For Grace, the nonprofit they founded more than 12 years ago. 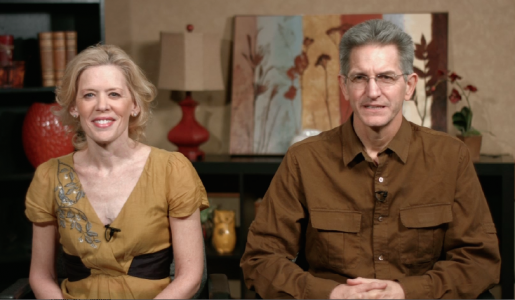 With more than 100 million adults in America with chronic pain, the couple believes it is important to offer help and valuable information through their website www.forgrace.org, public speaking and caregiver support groups. They have also gotten involved with legislation, most notably with the Assembly Bill 889 to reform the Step Therapy, or “fail first,” prescription practice. Step Therapy requires a patient to “fail” on up to five different medications before being allowed to have the one originally prescribed by his or her physician. For Grace is also committed to bringing light to the disparity of health care women face in the assessment and treatment of pain conditions. Its Women in Pain Awareness and Education Project helps to educate the public about gender disparities in pain management—women are more often under-treated for their pain, to inform and empower women to become better advocates for their health, and to enlighten policymakers about the major national health crisis of chronic pain. It is estimated that at least one-third of the American population live with chronic pain today, more than the number of people living with cancer, heart disease and diabetes combined. 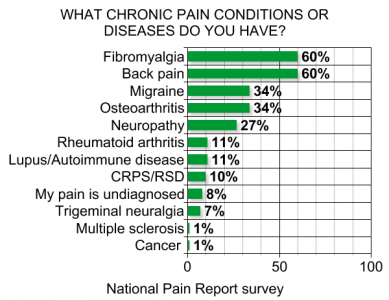 Pain is cited as the number one complaint for patients seeking medical attention in the country. Chronic pain is medically defined as any pain in the body that lasts more than three months. Learn more about CRPS and the physiological consequences of chronic pain here.